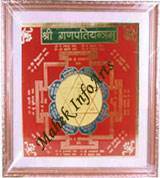 Vastu Dosh Nivaran Yantra	to remove Vaastu ill-effects from place of work/residence. 1. Auspicious & benefic time for fixing the main door, laying foundation stone and construction is not the same. 2. Main entrance to the house or flats may not be the same. 3. Buyers & owners vibrations may not be synchronising in all the cases. 4. All the buyers may not be religiously worshipping the house at the time of entry. 5. Direction of house/flat viz. Est, West , North & South may not be the same. 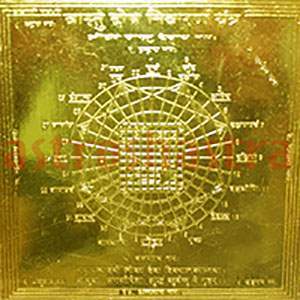 Therefore, it is one of very useful and beneficial Yantra in order to correct the energies of place. It removes ill-effects of Vaastu faults existing in any Structure. You can correct the Vastu faults by placing it in your Puja Place or hang it on the east wall. It rectifies without any demolition of sturcture. 1. It corrects the Vastu Defects without Demolition of structure. 2. 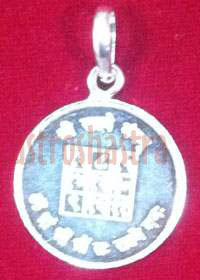 Generates the flow of Positive Energy in the Area, where placed.